The JSE closed weaker on Thursday after a relatively flat trading session as the local market anticipated the interest rate decision from the central bank. All the focus was on the South African Reserve Bank for the announcement of the interest rate decision following the MPC’s final meeting for 2018. The central bank decided to hike the repo rate by 25 basis points from 6.50% to 6.75% as the bank sees inflationary pressures for 2019. The rand seems to have a priced in a rate hike this entire week as it has gained significantly against the US dollar. 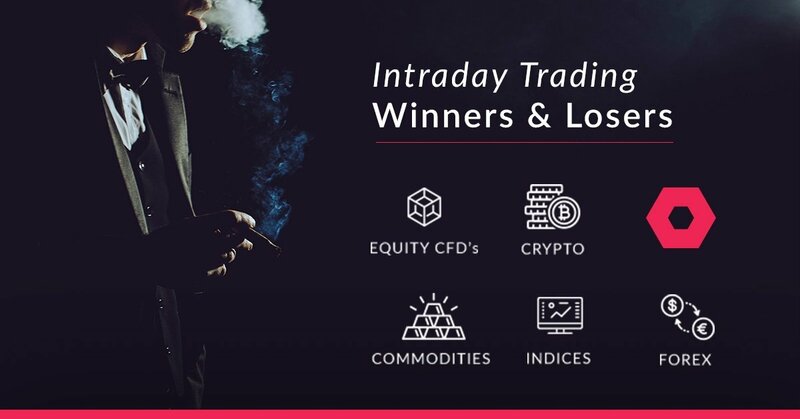 In today’s session the local currency rallied to a session high of R13.72 after the rate decision announcement, and at 17.00 CAT it was trading 0.91% firmer at R13.77/$. On the JSE, Mr Price [JSE:MRP] rallied to close 6.14% higher at R251.50 following the release of better than expected half-year earnings results. Tiger Brands [JSE:TBS] gained 4.84% to close at R284.00 despite reporting lower profit margins in their full-year results. RCL Foods [JSE:RCL] gained 3.66% to end the day at R17.00, while Famous Brands [JSE:FBR] firmed by 3.32% to R104.50. Newly unbundled Imperial Holdings [JSE:IPL] added 2.98% to close at R57.25, while Pick n Pay [JSE:PIK] closed 1.84% firmer at R70.86. 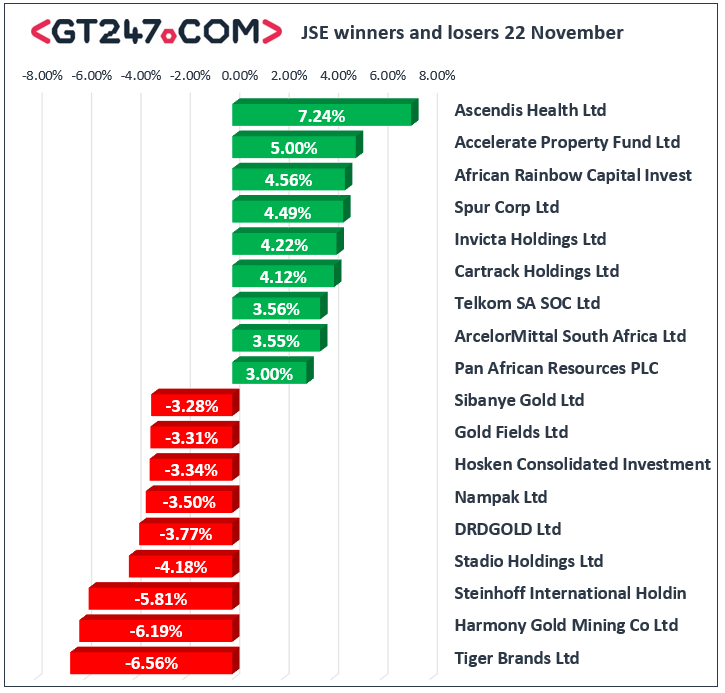 Miners came under pressure due to weaker rand metal prices which saw Pan African Resources [JSE:PAN] slump 9.49% to close at R1.43, while Sibanye Stillwater [JSE:SGL] lost 4.78% to end the day at R8.97. Rand hedge Sappi[JSE:SAP] retreated to R76.19 after dropping 4.56%, Mondi Ltd [JSE:MND] dropped 3.36% to R312.60, and Reinet Investments [JSE:RNI] lost 3.9% to close at R198.88. BHP Billiton [JSE:BIL] fell 2.64% to R277.47, while Anglo American PLC [JSE:AGL] closed 3.31% weaker at R290.94. The JSE All-Share index eventually closed 0.21% weaker, while the JSE Top-40 index dropped 0.25%. The Industrials index and the Financials indices gained 0.72% and 0.13% respectively, however the Resources index came under significant pressure as it fell 2.39%. Brent crude slumped to a session low of $62.27/barrel however it managed to rebound as traders anticipated a statement from OPEC on potential output cuts. The commodity was trading 0.13% weaker at $63.40 just after the JSE close. At 17.00 CAT, Gold was up 0.1% at $1227.27/Oz, Platinum was 0.12% weaker at $845.34/Oz and Palladium had lost 0.26% to trade at $1148.59/Oz. Ethereum was down 4.78% at $132.99/coin, while Bitcoin was 2.57% weaker at $4555.30/Oz.